Trigger points can be extremely painful and the world we live in and how we position ourselves on a daily basis predisposes us to getting them in our upper traps. If you've had them there before you know can attest how much they can hurt and cause a lot of other problems. This Study Spotlight takes a look at a couple treatment options in the treatment of these trigger points and how they might help. Researchers in this study looked at a comparison of utilizing Kinesio taping techniques (space correction) vs. trigger point dry needling and their effectiveness on treating myofascial pain in the upper trap. Groups were assigned at random and evaluated for trigger points and myofascial pain and then assigned to a treatment group. After comparing results the results showed that both treatments had comparable positive effects on pain perception and the pain pressure threshold. There was questionable effects on the cervical range of motion. There are always multiple ways to treat an injury or pain that a patient is experiencing. Trigger point dry needling can be extremely effective as a treatment but is highly invasive due to inserting single or multiple needles through the skin and into the tight tissue. For some people they tolerate it extremely well but for others, especially with needle phobia it can be near impossible to go through a treatment. The use of Kinesio taping is much less invasive and you only have to worry about potential skin irritation. It is also one that can last for up to 3-5 days depending on the application. This can allow for much less stress when it comes to treatment and removing any issues with needles. 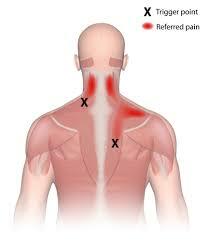 This means there is a good option for the use of multiple treatments to get the same positive effects on myofascial pain in the upper trap. It also brings up the possibility of combining treatments in order to try create a more positive outcome. Source: Dogan, Nesibe. Kinesio taping versus dry needling in the treatment of myofascial pain of the upper trapezius muscle: A randomized, single blind (evaluator), prospective study. Journal of back and musculoskeletal rehabilitation.